TOP: The newly paved road from I-40 to Pine Springs, Ariz., ends abruptly about a mile north of town. A rough dirt road, visible in the background of this photo, continues north to Arizona State Highway 264. 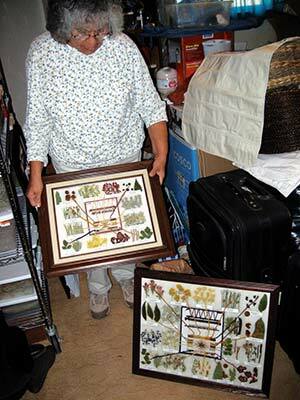 BOTTOM: Rummaging through her storage room, Oak Springs resident Isabel Deschinny locates two dye charts made by her family. Deschinny says her mother, weaving instructor Mabel Burnside Myers, devised the charts originally as a guide for her students, but later people began asking for a decorative version. Deschinny has followed in her mother’s footsteps and teaches weaving at the University of New Mexico’s Gallup campus. She has knowledge of about 300 native plants that can be used to dye wool. Imagine being a Siamese twin who doesn't always get along with his attached sibling. Now you know how it feels to be Oak Springs/Pine Springs Chapter. This heavily wooded chapter high on the Defiance Plateau south of Window Rock is basically two communities separated by only 12 miles. But the 12 miles is over a marginal dirt road that traverses a mountain pass. Nestled halfway between I-40 and Arizona State Highway 264, Oak Springs/Pine Springs could hardly be considered remote -- until you start driving around out here. The loose, sandy soil alternating with slickrock makes for some treacherous roads, even when they're dry. When they're wet or icy, they're all but impassable. For many years, Oak Springs and Pine Springs were in the same boat. Each community lay along a north-south dirt road that connected the two parallel east-west thoroughfares of I-40 to the south and Arizona 264 to the north. Back then, Pine Springs was the more thriving of the twin towns. "They had a school, a Catholic mission and a nice trading post," recalled Isabel Deschinny, who was born in Pine Springs but migrated to Oak Springs with her husband after their children were born. "The Pine Springs Road was the main route to Window Rock." The old log chapter house was in Pine Springs, too. Then, in the 1970s, the balance of power began to shift. The BIA was paving the Oak Springs road, which connects to 264 closer to Window Rock. By the early 1980s, when Deschinny moved to Oak Springs, you could get to Window Rock about twice as fast via Oak Springs as you could via Pine Springs. Families like Deschinny's, who were tired of getting stuck in the mud and wanted their kids to attend the larger, public schools in Window Rock, began to migrate to Oak Springs. Today, Deschinny estimated, Oak Springs is nearly twice as large as its sister town. And the chapter house is now located there. Bypassed by through traffic, the Pine Springs trading post closed, leaving the chapter without a single private enterprise. "So you can see why Pine Springs sometimes feels like they don't always get their share," Deschinny explained. 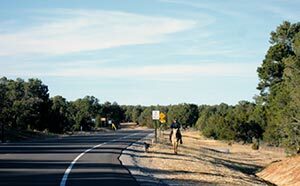 If asphalt is the great equalizer, Pine Springs may catch up to its sibling soon. The 11 miles between Houck and Pine Springs was finally paved this past summer, and the locals say they won't rest until the road north is paved. In the meantime, both these tiny communities have much to recommend them. As the names imply, the area is rich in timber, and people from around the reservation come here to cut wood, Deschinny said. "You see them about this time of year, their trucks piles high with wood, their chain saws lying on top and maybe a dog sitting up there," she said. "That always makes me smile, those dogs perched on top of the woodpile." They mined copper here at one time, on a hill that is considered a sacred site by the locals. The copper deposit had nuggets of turquoise, and according to Deschinny, you can still find them if you're patient enough to sift through the tailings. The area is rich in the plants weavers use for natural dyes. Deschinny is an expert on such things, and passes on her knowledge in her weaving class at the University of New Mexico's Gallup branch. Name:The English names are, obviously, descriptions of water sources in each of the two communities. But in the original Navajo, the towns were named for different plants. Pine Springs was originally known as T'iis 'Ii'Ahi' (Lone Cottonwood, for a tree that used to stand behind the trading post), and Oak Springs was Teelch'init'i'i (Cattails in a Row). Between the two communities is the sacred hill known as Dziihidzoh where copper was once mined and where some still hike to pray and leave offerings. Problems: Although the chapter is, as the crow flies, convenient to Window Rock and Gallup, treacherous dirt roads make the journey difficult from Pine Springs. Navajo Rte. 12 through Oak Springs was paved starting in the 1970s, which created some friction between the two communities. The road from Pine Springs south to I-40 was paved just this spring. Claim to fame: Pine Springs was studied by the filmmaker and anthropologist John Adair for 50 years, resulting in numerous publications and the film project "Through Navajo Eyes" in which Navajos filmed life in their community. History: According to Ashem Dayea, president of the Pine Springs Association, the area has had a trading post since the 1880s, when the railroad was coming through. According to oral history, bandits hid out in these rugged canyons to attack the supply caravans for the railway, and it's possible some of the local Navajos participated in the raids. The deep, heavily wooded washes also concealed some Diné from soldiers rounding up Navajos for the Long Walk. "Some areas only have one or two plants they can use for dyes," she said. "But here, we have probably about 300 of them." Deschinny's mother, weaver Mabel Burnside Myers, originated the decorative dye charts you can still find in the gift shops on the Navajo Nation, with the miniature rug with yarn trailing out to dried samples of the plants used to dye it. "She started out just making little cards she could carry around to her weaving classes," Deschinny recalled. "Then people started asking her to make something they could hang on their walls." The framed dye charts became more popular than Myers' rugs, and she recruited her children to help her make them. "We spent hours making those dye charts," Deschinny recalled. She, in turn, has passed the knowledge on to her children. Son Mark is an expert yarn dyer, and also crafts beautiful weaving tools that are in demand all over the country. Mark has also taken over for his mother as secretary of the Pine Springs Association. Originally formed in 1996 to raise funds to build a cultural center to house the archives of anthropologist John Adair, the association has morphed into sort of a mini-chapter meeting for Pine Springs, Isabel Deschinny said. Isabel, a founding member, does not approve. "I believe they should have stuck to their original mission," she opined. "But it's up to the young people now, and some of them don't even remember John Adair." Ashem Dayea, president of the Pine Springs Association, defended the new direction, pointing out that Pine Springs has a long history of getting together for community activism. "For instance, the school," he said. "People probably think the BIA just planted it there, but it was my grandfather, my grandfather's brother, the trader Sam Day and a bunch of other people who got together and decided there should be a school there." As for the Adair collection, the association is in the process of digitizing the films so they can be posted online and viewed -- a more accessible and less expensive alternative to building a structure to house them. While there is land reserved by the community and some buildings that used to be the chapter compound, the land was withdrawn so long ago that modern requirements like archeological clearances were not followed, Dayea explained. "It would be nice to have a building, but we would have to take care of all those things first," he said. A filmmaker and anthropologist, Adair documented life in Pine Springs for about 50 years. His collection of photographs, films and publications is currently housed at the Wheelwright Museum in Santa Fe, N.M., but is owned by the association, under terms Adair negotiated with the association and the museum before his death in 1997. "He was a real nice man," Deschinny recalled. "He was really good friends with my family. The community took him in." At a time when the tribe was being studied extensively, Adair was one of the few who thought the Navajos deserved to own their own stories. He put video cameras in the hands of some community members for the project "Through Navajo Eyes," and made sure to show the films on the Navajo Nation. One of the 1966 films was recently shown in Pine Springs, and the subjects enjoyed reminiscing while the younger folks learned about what life was like for their parents and grandparents. Some from Pine Springs might say it wasn't that different. Even back then they were talking about paving the road.